Palestinian Authority Arab terrorists attacked Israeli vehicles Monday, hurling rocks to force drivers to lose control of their cars. Palestinian Authority Arab terrorists were out on the road in Judea and Samaria attacking vehicles with Israeli license plates late Monday afternoon, hurling rocks in an attempt to force drivers to lose control of their cars. Rocks were hurled at vehicles traveling south of the Jewish community of Shilo, in the Samaria region, with one car failing to escape being struck by attackers near the village of Turmus. None of the passengers in the car were physically injured, but the vehicle itself was damaged. IDF troops launched a search for the attackers. 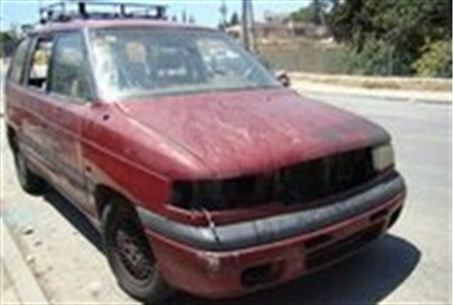 Seven PA Arabs from the village of Harbata al-Masbah, ages 20 to 31 were recently arrested for similar attacks on vehicles bearing Israeli license plates traveling on Route 443, a central highway. Two days ago, four Jews were injured by PA Arabs who hurled rocks at them in the Givat Ronen neighborhood, next to the Samaria Jewish community of Har Bracha. One of the victims was hospitalized in fair condition as a result of the attack. Rocks are used as a weapon of choice by Arabs in the Palestinian Authority because they are a natural resource and easily available -- yet appear perfectly innocuous, creating the perfect "underdog photo op" for international cameras. However, what is often not realized is that the stones in Judea and Samaria are extremely hard -- composed of quartz, limestone and flint -- and are irregularly-shaped, with razor-sharp edges. They can be, and often are, deadly when hurled at a victim's head or body, or at the windshield or window of a passing vehicle.